Come aboard Hammock Beach Resort’s 117-foot Sundancer Yacht and explore the City of St. Augustine from the Intracoastal Waterway. From December 16 – 30, view St. Augustine's dazzling Nights of Lights from the luxury yacht or learn about the Old City with narrated historical sightseeing tours. General admission for Sundancer’s Nights of Lights cruises is $16 for adults, $10 for children 6 – 12 years old and free for children under 6 years old. General admission for Sundancer’s historical sightseeing tours of St. Augustine is $25 for adults, $10 for children 6 – 12 years old and free for children under 6 years old. For additional information about the cruises, contact (877) 446-6465 or sundancerreservations@hammockbeach.com. In addition to being the oldest city in the nation, St. Augustine was named one of the "Top Ten Places to See Holiday Lights" by National Geographic Magazine. Viewers can experience the beautiful and festively decorated city and its rich history from the most comfortable, unique viewing place possible – aboard the Sundancer Yacht on the Intracoastal Waterway. The Sundancer’s Nights of Lights cruises and historical sightseeing tours depart from the west side of St. Augustine’s Bridge of Lions. The holiday lights tours of St. Augustine are approximately one hour and the historical sightseeing tours of St. Augustine are approximately one and a half hours. 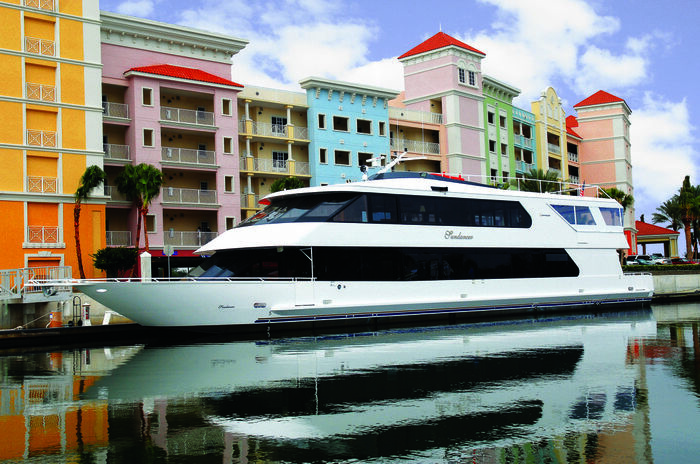 Guests must board the Sundancer 15 minutes before departure. Parking is available in Downtown St. Augustine. Full cash bar and snacks are available. For specific cruise times, reservations or additional information about the Sundancer Yacht’s cruises, please contact (877) 446-6465 or sundancerreservations@hammockbeach.com. For private charters, please contact Harmony Henry at (386) 264-1640 or hhenry@hammockbeach.com.